Edit (Nov 1, 2015): Bounty awarded, but the full question (i.e., what is the optimal strategy) remains open at the time of this update. 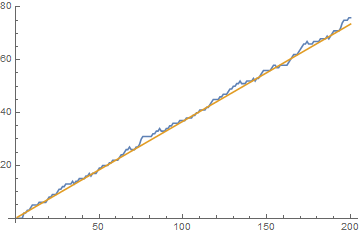 Given a list of positive integers $1, \ldots, n$, two players (red and blue) alternate turns. On each turn, the player picks and circles (in their color) any un-circled number $k$ that has at least one proper divisor yet to be circled; their opponent responds by circling (in their own color) all remaining proper divisors of $k$. Then they switch (colors adjusted accordingly) and the game continues until there are no legal moves remaining. 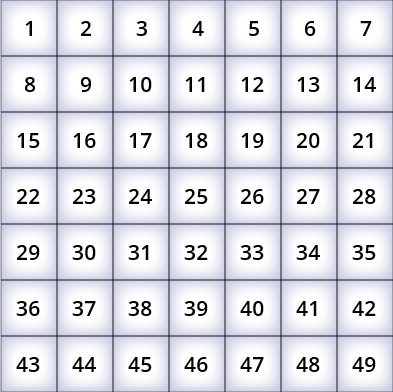 At that point, each player adds up their circled numbers and the greater sum wins. Question: What is the optimal strategy in the Factor Game? My guess is that, for large enough $n$, picking the number that nets the most points on each individual turn is optimal. For example, if $n = 49$, then the first player would pick $47$ (to net $46$) and their opponent would respond with $49$ (to net $42$). But this strategy is admittedly short-sighted. I am hoping for a description of an optimal strategy and a proof that it is optimal (for $n$ large enough), but would be interested in special cases, heuristic arguments for what would be an optimal strategy, and heuristic arguments for why this problem is difficult. Motivation: This game is sometimes played in elementary schools (or, in my classes, with elementary school teachers) to explore concepts like prime, composite, divisor, proper divisor, etc. In such a case, the numbers are usually presented in an array - often a square array, and so my particular interest is when $n$ is a square. You can play the Factor Game through the NCTM (National Council of Teachers of Mathematics) Illuminations site if you would like to experience it for yourself. The greedy strategy may be described, as stated in the OP, for large enough $n$, as locally optimal number-picking so as to net the most points on each individual turn. With this approach, it is possible to avoid the "play low" game as described below, along with its obvious pitfalls. gives $5, 7, 11, 25$ (hence, choose $25$ as the opening play since it is the largest odd semiprime in the given range) as the winning opening numbers for player $1$. results in all positive values. Modifying the first choice to $2$ (as opposed to the largest prime in the range) where the "short-sighted" solution fails appears to be the winning strategy. strat[n] for any $n\geq30$ should then force a win for player $1$ for most $n$. Note that player $2$ plays the local optimal strategy, but, though I would be surprised if an alternative strategy could force a win for player $2$, this possibility is yet to be explored. Of course, since the game will be reversed if player $1$ chooses $1$ to start, and in so doing, allows player $2$ to go first, if player $2$ plays by the same strategy, he will choose $2$, etc., making the game rather absurd. A rule that either player may not forfeit a turn should then be adhered to, if a sensible solution is to be arrived at. Not the answer you're looking for? Browse other questions tagged elementary-number-theory reference-request recreational-mathematics combinatorial-game-theory algorithmic-game-theory or ask your own question. Optimal strategy for this Nim generalisation? Has a simple optimal or provably near optimal strategy been shown for backgammon bearing off?